Descent: Journeys in the Dark Second Edition is a board game in which one player takes on the role of the treacherous overlord, and up to four other players take on the roles of courageous heroes. During each game, the heroes embark on quests and venture into dangerous caves, ancient ruins, dark dungeons, and cursed forests to battle monsters, earn riches, and attempt to stop the overlord from carrying out his vile plot. Featuring double-sided modular board pieces, countless hero and skill combinations, and an immersive story-driven campaign, Descent: Journeys in the Dark Second Edition transports heroes to a vibrant fantasy realm where they must stand together against an ancient evil. 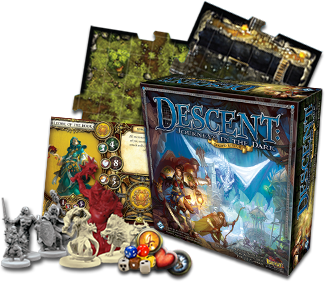 Kevin Wilson’s Descent: Journeys in the Dark has been among Fantasy Flight Games's most popular titles for nearly ten years, redefining the dungeon-delving genre and setting the gold standard for engrossing gameplay and top-notch components. With the updated second edition, this tradition of excellence continues. While longtime Descent fans will find a new way to enjoy this classic favorite, a new generation of hobby games enthusiasts will be introduced to its engaging tactical gameplay and immersive narrative. Whether you’re a newcomer or a veteran, you’re sure to appreciate Second Edition’s new heroes and monsters, streamlined rules, class-based hero system, campaign play, and much more. Read on to learn about the specific enhancements Second Edition introduces! From simpler rules for determining line of sight to faster setup of each encounter, Descent: Journeys in the Dark Second Edition delivers a tense, satisfying experience with minimal player downtime. Defense dice mitigate the tendency to “math out” attacks, while shorter quests with plenty of natural stopping points mean that even the busiest group can now fit Descent into a varied night of gaming. What’s more, since all necessary statistic, conditions, and effects are listed conveniently on their respective cards, you’ll be able to leave the rulebook in the box! All of this, along with an intuitive new mechanic for controlling the overlord player’s nefarious powers, ensures that Descent: Journeys in the Dark Second Edition retains the tactical challenge of its predecessor, while making Descent more accessible than ever before. Rather than collecting threat tokens to spend on traps, minions, and other nasty tricks, the overlord simply plays cards from his hand based on their clear and straightforward triggering conditions. Just draw cards to your hand each turn, and play them when you choose! Descent: Journeys in the Dark Second Edition’s character selection and creation process gives your group the tools to quickly build a team of heroes that perfectly fit your play style. Each player begins by choosing one of four major archetypes: mage, warrior, scout, or healer. Within each archetype are classes, providing distinct play experiences even between multiple players sharing the same archetype. As a warrior, will you take the role of the valiant Knight, providing protection to your physically weaker companions, or will you play as the mighty Berserker, cutting a swath of destruction through your foes? With Descent Second Edition’s enhanced experience system, you’ll have total control over your character’s growth and development. Each class has its own deck of skill cards, and setting your hero on a path to greatness is as simple as selecting your starting skills. As you gain more experience throughout the included campaign, you’ll be able to periodically spend it on additional skills, adding to your hero’s available abilities. For example, once you’ve chosen the warrior archetype and the Berserker class, will you concentrate on taking down multiple foes at once or dealing devastating blows to single combatants? These compelling choices, and many others, drive Second Edition’s quick and intuitive character system. An enthralling story-driven experience, Descent: Journeys in the Dark Second Edition pits Terrinoth’s greatest heroes against the machinations of an insidious opponent. When the heroes arrive at the once idyllic barony of Rhynn, they find it imperiled by a rising tide of ferocious monsters and foul magics. But can they unravel the true horrors behind these alarming assaults? With encounters that function as both standalone experiences or as part of a linked series of quests, Second Edition offers an out-of-the-box campaign story line that scales brilliantly to accommodate a variable number of players. The story even adapts to your successes and failures! Did you make it out of the dungeon alive, but fail to complete an important objective? Your failure may have strengthened an unknown enemy, or robbed you of some future opportunity (although you’ll still earn some experience points before proceeding). With its many cleverly designed plot branches, Second Edition’s captivating narrative creates the genuine sense of an ongoing and reactive fantasy world… in which you are the only hope. Want to transfer your favorite heroes and monsters from your Descent First Edition collection? The Descent: Journeys in the Dark Second Edition Conversion Kit includes everything you need. With Second Edition-compatible cards for every monster and hero ever produced (including promotional heroes! ), this convenient conversion kit is an indispensable tool. So whether you want to bring your extensive Descent collection with you on new adventures, or you’ve got a favorite hero that you choose every time, you'll find what you need here. In this popular game of dungeon-delving adventure, one player takes on the role of the overlord, tasked with thwarting the heroes at every turn through the use of deadly monsters and cunning traps. Each of the other players controls a hero, and they team up to complete certain objectives dictated by a scenario. The scenario being played also prescribes the construction of the board, which is built of interlocking modular pieces to create a new dungeon every time! The dungeons below Terrinoth are crawling with horrible minions of the overlord player, all waiting to put an end your quest. However, not only does the overlord have access to the monsters on the board, but his forces are periodically reinforced. If the heroes don’t stay vigilant, they might find themselves quickly overwhelmed by their foes. Are you prepared to brave the dungeons and crypts beneath Terrinoth? Gather your party, and stand together against the forces of evil! - An all-new DLC experience has arrived in Road to Legend. Test your might in the Trials of Frostgate! - Added support for the following languages: Czech, French, German, Italian, and Spanish. Added Nerekhall: Seeds of Corruption campaign. Added new ambient tracks to all quests. The Delve: Fixed Queen Ariad appearing in Act I. The Delve: Fixed Raythen/Serena boss fight when using Raythen/Serena hero. The Delve: Foxed components being used that were removed from the user's collection. Fixed Merick displaying previous monster's instructions. Fixed elemental activation and door placement in Burning Wrath quest. Changed "Bone Wand" from Act I to Act II. Fixed travel event displaying "TRAVEL_JOYFUL_INN_2." - Fixed monster activations displaying only the first line of the activation. - Fixed Serena Lieutenant activation text. - Fixed Health discrepancy of Abomination during tutorial. - The Delve: Added clarification for Workman’s Ring. - The Delve: Fixed Jinn’s Lamp issue. The copyrightable portions of Descent: Journeys in the Dark Second Edition, its expansions and miniatures are © 2005-2012 Fantasy Flight Publishing, Inc. Descent: Journeys in the Dark, its expansion titles and Fantasy Flight Supply are trademarks and/or registered trademarks of Fantasy Flight Publishing, Inc.